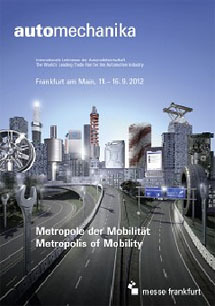 We will participate in "automechanika 2012 Frankfurt "
We TRIENS Sankyo Reels, Inc. are glad to inform you that we will participate in the forthcoming auto maintenance show "automechanika 2012 Frankfurt "
As you may know the automechanika is world- wide trade show that is specialized in the auto maintenance. It is hold in several countries in the world, but the one that takes place in Frankfurt is realized in the largest scale, many enterprises focus on this show to release a newly developed product. This time we TRIENS Sankyo Reels, Inc. will display not only strong seller reel products but also new enclosed reels and wide unit type reel boxes, we are glad to inform you that both of them are highly appreciated by American and European users. Also we are planning to show you some component example with our reel WHS that is welcomed warmly in French market since it is released in last year. We are sure that you can discover several unique and astonishing possibilities of use of reel products. We are looking forward to seeing you in this occasion at our stand, where you can taste exquisite Belgian beer and coffee, served by our staff in Belgium.